Book an Alicante Airport Shared Shuttle Transfer to and from Torrevieja, choose from four handy stops. 1: La Veleta Residencia San Marino Bus Stop opposite ALDI Supermarket. 2: Opposite C.C Habaneras (Carrefour) Bus Stop in front of the local Police station. 3: La Siesta / El Chaparral at the Bus Stop opposite Pizzaria El Campobello. 4: Urbanizacion San Luis at the Bus Stop opposite Asia Jardin restaurant. From only 18€ per person. Operated by South Connect Shuttle in a minibus or coach and is available all year 7 days a week for transfers to or from Alicante airport: WINTER From November 1st until March 31st for flights arriving or departing between 08:00 and 22:00. SUMMER From April 1st until October 31st for flights arriving or departing between 08:00 until 00:00. For a private (taxi) service available to private addresses please book with Alicante Private Transfers. Torrevieja fare starts from 58€ each way including up to 4 passengers. 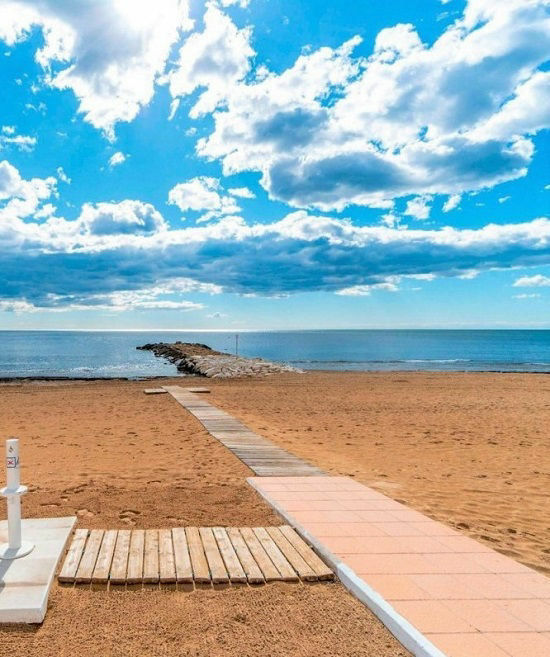 Torrevieja is 55 km from Alicante airport with an average journey time of 75 minutes by shuttle and about 60 minutes by taxi, depending on traffic, time of day and number other stops along the way when using the shared shuttle service. Alicante Airport Transfers to and from Terrevieja by Daily Express Bus from 7€ Shuttle from 18€, Private fro 60€.